The Brahma Purana (Sanskrit: ब्रह्म पुराण, Brahma Purāṇa) is one of the eighteen major Puranas genre of Hindu texts in Sanskrit language. It is listed as the first Maha-Purana in all the anthologies, and therefore also called Adi Purana. Another title for this text is Saura Purana, because it includes many chapters related to Surya or the Sun god. The name Brahma Purana is misleading and apocryphal because the extant manuscripts of this text have nothing to do with the Hindu god Brahma, and are actually just a compilation of geographical Mahatmya (travel guides) and sections on diverse topics. The extant text is likely not the ancient Brahma Purana, but one that was completely changed between the 13th to 16th-century, may be after. The surviving manuscripts comprise 245 chapters. It is divided into two parts: the Purvabhaga (former part) and the Uttarabhaga (latter part). The text exists in numerous versions, with significant differences, and the text was revised continually over time. Further, the Brahma Purana likely borrowed numerous passages from other Hindu texts such as the Mahabharata and Puranas such as the Vishnu, Vayu, Samba, and Markandeya. The Brahma Purana dedicates a majority of its chapter to describing the geography, temples and scenes around the Godavari River and of Odisha. 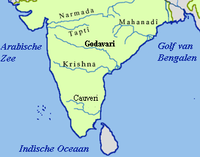 The text is notable for dedicating over 60% of its chapters on description of geography and holy sites of Godavari river region, as well as places in and around modern Odisha, and tributaries of Chambal river in Rajasthan. This travel guide-like sections are non-sectarian, and celebrates sites and temples related to Vishnu, Shiva, Devi and Surya. The coverage of Jagannatha (Krishna, Vishnu-related) temples, however, is larger than the other three, leading scholars to the hypothesis that the authors of extant manuscripts may have been authors belonging to Vaishnavism. Its presentation of the Konark Sun Temple is notable. Out of 245 chapters, 18 chapters of the Brahma Purana cover the cosmology, mythology, genealogy, manvantara (cosmic time cycles) and topics that are required to make a text belong to the Puranic genre of literature. Other chapters cover Sanskara (rite of passage), summary of Dharmasastra, its theories on the geography of earth, summary of Samkhya and Yoga theories of Hindu philosophy, and other topics. While many chapters of the Brahma Purana praise temples and pilgrimage, chapters 38-40 of the text, a part of embedded Saura Purana, present arguments that are highly critical of the theistic theories and devotional worship proposals of 13th-century Madhvacharya and Dvaita Vedanta sub-school of Hindu philosophies. Shiva is Atman (soul, self). The Padma Purana categorizes Brahma Purana as a Rajas Purana, implying the text is related to Brahma, but extant manuscripts have nothing to do with Brahma. Scholars consider the Sattva-Rajas-Tamas classification as "entirely fanciful" and there is nothing in this text that actually justifies this classification. The manuscripts of travel guide to Godavari-river region from this Purana is found as a separate text, and is called Gautami-mahatmya or Godavari-mahatmya, while the one corresponding to Rajasthan region is called Brahmottara Purana. The tradition and other Puranas assert the Brahma Purana had 10,000 verses, but the surviving manuscripts contain between 7,000 and 8,000 verses exclusive of the Brahmottara Purana supplement which adds between 2,000 and 3,000 verses depending on different versions of the same text. Sohnen and Schreiner published a summary of the Brahma Purana in 1989. ^ a b c d e f Dalal 2014, p. 80. ^ a b c d e Rocher 1986, p. 155. ^ a b Wilson 1864, p. xxvii. ^ a b c d e Rocher 1986, pp. 154-156. ^ a b c Rajendra Chandra Hazra 1940, pp. 145-156. ^ K P Gietz 1992, p. 530 with note 2945. ^ Wilson 1864, p. xxvii-xxix. ^ Winternitz 1922, pp. 511-512. ^ a b Rocher 1986, pp. 155-156. ^ Wilson 1864, p. xxviii-xxix. ^ a b Winternitz 1922, p. 512. ^ Rocher 1986, p. 221 with footnote 385. ^ Wilson 1864, p. 12. ^ Renate Söhnen; Peter Schreiner (1989). Brahmapurāṇa. Otto Harrassowitz Verlag. ISBN 978-3-447-02960-5. This page was last edited on 5 April 2019, at 02:02 (UTC).